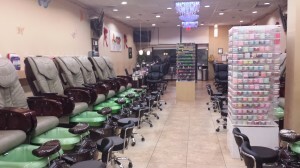 Welcome to Designs Nails & Spa in Pasadena, TX 77505. With the years of experience, we take pride in doing a great job in this industry. Come and visit Designs Nails & Spa, you are assured to enjoy a new time, new things and new adventure at an airy and clean space. With the variety of nail care services, our valued customers are freely to choose the one which is suitable for their style and favorite. We all know that your satisfaction is our mission, it leads us to trive for the high quality and safety services. Your nails would be treated carefully and thoroughly by our talent and professional staff, they always try to meet our customer’s requirement in the best way. Especially, Sanitation is our first priority, all the instruments are sterilized after every uses. With Designs Nails & Spa – Your beauty would be raised up and become enjoyable than ever!